Talk and listen to Hams around the world at home using a small handheld radio! I just got started in DMR and have found it pretty easy and inexpensive. 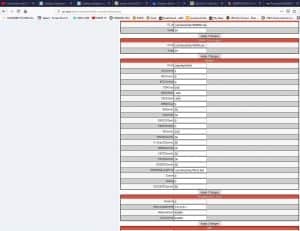 With an Internet connection and the Ailunce HD1 combined with the MMDVM hotspot (Jumbo Spot) it is possible to talk to Hams around the world. 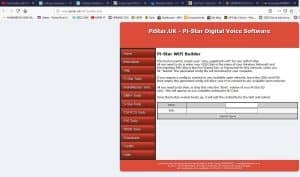 So is this Ham Radio or is it (VOIP) Internet? 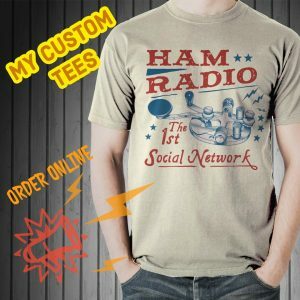 I see it as Ham Radio and using the Internet as a tool. What are your thoughts? 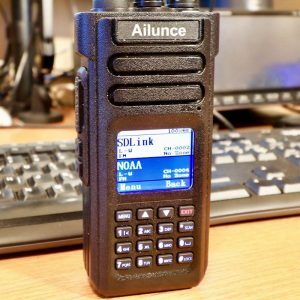 Using a handheld digital transceiver like the Ailunce HD1 we can communicate around the world from home. It doesn’t matter if you have local DMR digital repeater or not. I do not in my area, so I use the Jumbo Spot (MMDVM hotspot). If you have a local digital DMR repeater you won’t need a MMDVM hotspot, but that’s for another article. The Jumbo Spot allows Hams to operate on one or more digital modes without the use of a repeater. The Jumbo Spot basically becomes your private repeater. Here we are using DMR mode. The handheld connects to the Jumbo Spot in your home and it connects to talkgroups on Internet servers around the world using your Internet connection. You need a digital transceiver like the Ailunce HD1 and a MMDVM hotspot like the Jumbo Spot. There are other more expensive alternatives. Of course you’ll also need Internet access from your home. I have cable service and the cable service provides me with a cable modem and WIFI router. The nice thing about the Ailunce HD1 handheld is that it also communicates with our local analog repeaters. I consider it my dual purpose (analog/digital) VHF/UHF transceiver. The terms MMDVM hotspot and Jumbo Spot are used interchangeably. MMDVM stands for Multi Mode Digital Voice Modem. There are alternatives on the market and some run as much as $200, but the Jumbo Spot I found costs $85 shipped from California. This is a good E-Bay seller and I have had numerous contacts with her. When the SD card went out after two days she reimbursed me for it, no questions asked. This device is a Raspberry Pi zero W (WiFi) with a Jumbo Spot RTQ MMDVM Hotspot expansion board. It’s the least expensive of the alternatives that I researched and a reliable solution! You can build these if you want, but I chose to buy it assembled and with the software ready to go (almost). What does RTQ stand for? Ready To QSO! You will need a DMR ID to setup the hotspot, so if you don’t have one go to RadioID and register for an ID. You will also need power for the hotspot. I use a phone charging cable and a USB port. 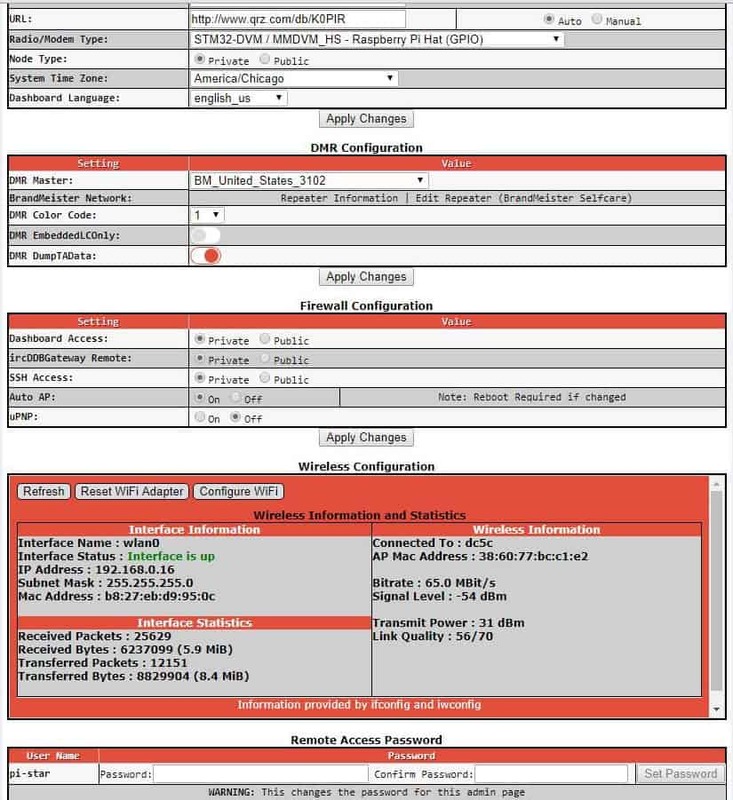 Go to the WiFi Builder configuration utility here and use it. Then download the wpa_supplicant.conf and save to the TF card root directory. Insert the TF card into the hotspot and power it on. It will load after about 3 minutes and should be on your home network. In your web browser url field type in, http://pi-star, when prompted the username is: pi-star. The password is: raspberry. That will take you to the hotspot configuration page below. It’s pretty straight forward and I’ll show you my configuration in the video and also a little trick to keep the bit error rate (BER) down. The video below shows a good example of transferring the TF card back and forth between the Jumbo Spot and computer. Have a look at the beginning. 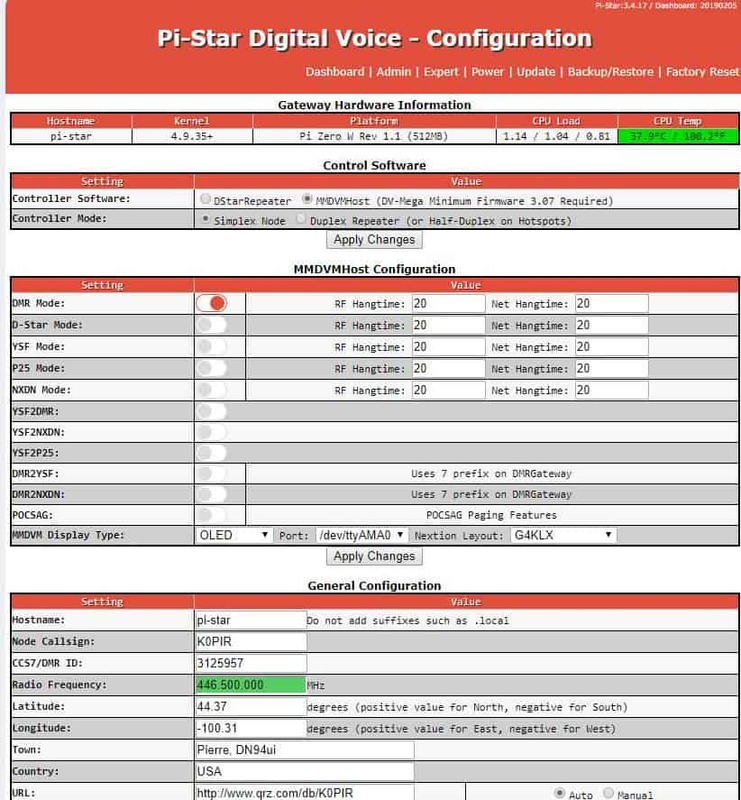 The software and firmware of the Jumbo Spot is easily updated using the pi-star software. Are you on DMR? What are you thoughts on it? Nice to hear from you and thank you for commenting here. I don’t believe so, I did not have to and I have not heard anything like that. If you can set it up as a temporary DMZ that would answer your question. That’s usually pretty easy to do in the router. 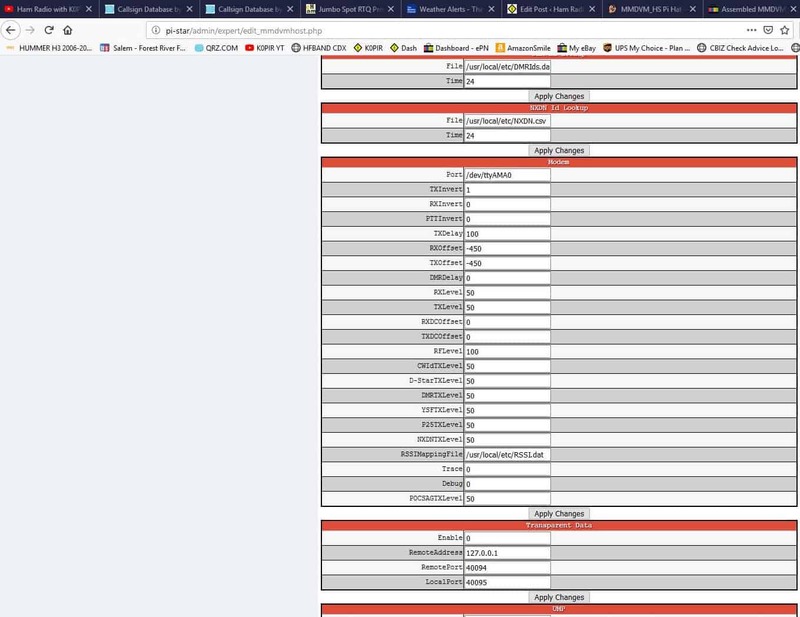 I would think it’s just a configuration error somewhere and look at the Configuration I have again to see if you have a typo in there or something not configured properly. Use the same server that I show in the video and configuration photos. If you have an HD one I also have a video on it. By the way I don’t think I got the parrot to work on mine. I am not sure why, but since it is working otherwise I didn’t bother with it. 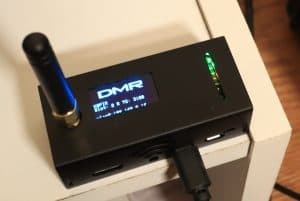 Can there be any issues between the DMR hotspot and the server that it connects to? I can send all day but have only heard one gentleman testing something. 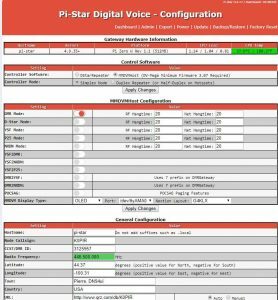 I have tried on parrot and I see the hot spot responding and then listening. Then I hear no reply. I also have another DMR radio and I have sent on that and do not hear any traffic on the hot spot. 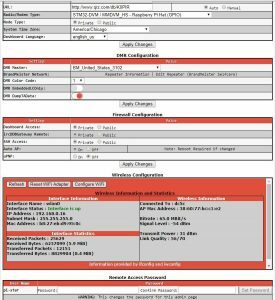 Firewall issue on the router? Do I need to open firewall ports on the router or forwarding ports on the router? Great post. I need help in understanding how I would configure the Radio to transmit to the Jumbo Spot. Nice to hear from you and thank you for commenting here. I appreciate the input and thank you! I am not really familiar with the 7100. It looks like it has D-Star though. The pi-star software in the Jumbo Spot has D-Star. I would do some searching and see how it works. That’s very interesting about the 7100 and thank you again. I have a Icom7100 which has DMR capability. That’s one of the reasons I bought it, but sadly, later found I cannot hit any of the DMR capable repeaters in my area. Too far away I guess. Looks to me like the Jumbo Spot should work with the 7100 like the handheld you described. Am I correct in my assumption? Right now, with the FCC crackdown on chinese DMR Radios, it’s hard to know which ones are compliant and which ones are not. I believe your Ailunce is on the FCC blacklist now, but I see it’s still being sold on Amazon. I guess I’ll wait and see which ones get put on the compliance list later then decide if I want to give DMR a try. I know there’s been discussion about that and we even discussed it a a ham club meeting one evening but we didn’t get too far with it. I think the majority of us own one of the Chinese radios. I don’t know much about these things but, looking at my Ailunce HD1 I see it has a FCC ID label. I know they are selling them in the United States. These are good things to be aware of especially since they transmit out of band. Honestly I just wish they would have taken precautions like other manufacturers. Thanks again John best 73! Thanks for the article Rich. In my opinion, using the Jumbo Spot with your transceiver makes it a VOIP hybrid. 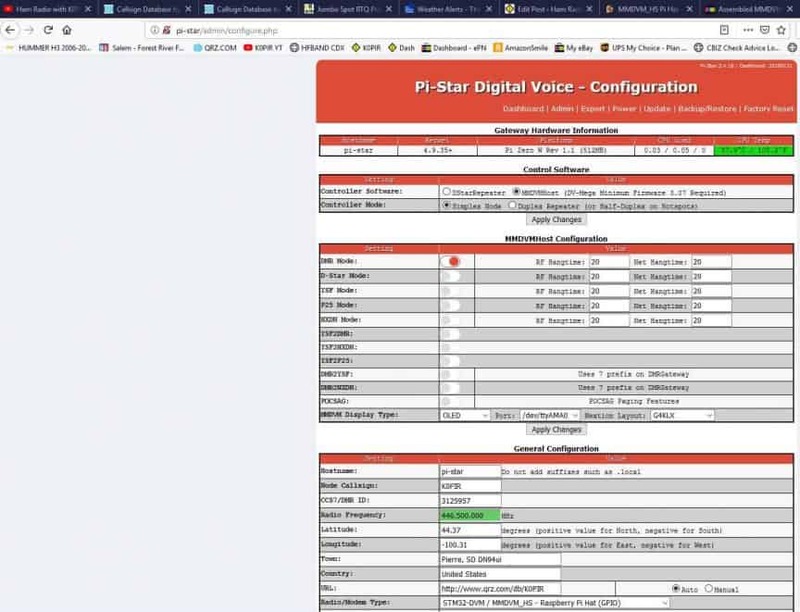 Not completely VOIP since you are using a handheld transceiver, but still VOIP since it is transmitted digitally over the internet. Yes there is a difference. Not to confuse things, but to keep it simple, I usually think of a Wi-Fi hotspot as a device inside a restaurant or café that I can connect too with my laptop and connect to the Internet. That’s a easy way of looking at it. Most Internet service providers provide a modem with a wireless router and that’s what I am using to connect my jumbo spot too. The jumbo spot does not have a wired connection, only wireless. I have not used the raspberry pi as a hotspot, but I think I’ve seen them. I’m not sure how easy it will be to configure, but I bet there’s a lot of help out there. Thanks again and hope to hear you on, 73!